That is a truly awful thing to say despite how one may or may not feel about a sport. And this sport for all it's brutality does at least have the point of proving meat for people who might not otherwise be able to afford it. Further unlike the Roman Colosseum exotic animals are not being transported in sololy to fight or die as entertainment. The bull is not drugged nor handicapped in anyway. If it performs well it may be spared or win another chance at life. If it fails then at least it has lived a life rather than being born, raised, and slaughter on an assembly line. Then again I actually enjoy the sport so I might be a bit biased. Well, this is interesting, a view from both side of the fence. I have to admit after seeing this footage, the sport does seem rather barbaric and aging it does not make it more humane. I guess it is payback after being taunted and speared like that. 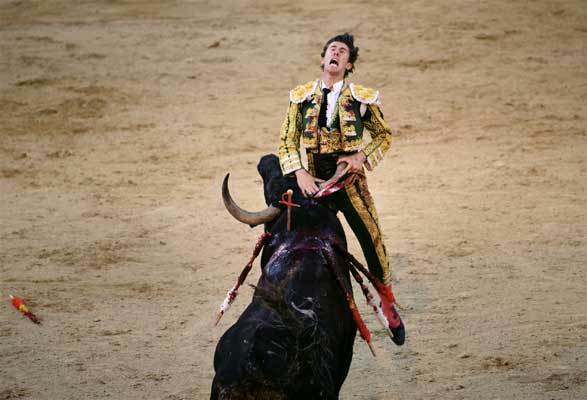 Regardless of whether it is an assembly line or a bull ring, I am sure the bull does not enjoy either experience.